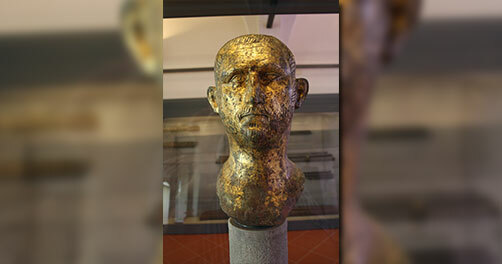 Not much is documented about Probus before he joined the military, around 250 AD, when he was of age. Civil wars and tribal attacks over the past decade provided the need for the Roman Empire to address many different fronts with as many recruits it could gather. Probus distinguished himself as he was appointed a military tribune under Valerian. He continued to excel under Aurelian, recapturing Egypt from control under Palmyra in 272. Under Tacitus, Probus was appointed governor of the East. When Tacitus died suddenly in June 276, either by a fever or assassination (accounts vary), Florian was declared emperor by his troops while campaigning with them in the West. In the East, the soldiers under Probus elevated him as emperor. Florian controlled the larger force, but Probus marched on him, the armies meeting in Cilicia. Probus avoided a direct assault, being the more experience military commander. Winning a small skirmish, and the heat of summer beating on Florian’s troops, Probus calculated correctly the standoff would be short. In August or September, Florian’s troops turned on him, and after a reign of only 88 days, murdered him and united under Probus. After securing the title of sole emperor, Probus had to immediately set out for Gaul to attend to the unrest in the area. Along the way, he spent the winter of 276 in Siscia, defeating the Goths there and restoring much of the Balkans. He then passed through Rome and arrived in Gaul in Spring 277. He spent the next two years campaigning in the region successfully against the Alamanni and Longiones, meanwhile his generals were battling the Franks and Burgundians. After Gaul, Probus spent 279-280 defeating the Vandals in Illyricum, Raetia and Lycia while his generals defeated the Blemmyes in Egypt. All while this was going on, Probus was resettling Germanic tribes in the devastated regions. While all of the campaigning showcased the brilliant military strategy of Probus, as he was outnumbered in most of his battles, what he did with the infrastructure for the empire was also vitally important. When soldiers were not actively out campaigning, Probus had them doing civic works, such as rebuilding bridges and draining marshes. Something the soldiers didn’t at all care to do. 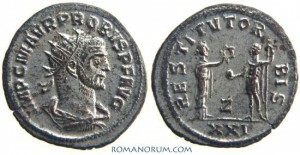 After having restored the provinces in Europe, attaining the titles of “Gothicus Maximus” and “Germanicus Maximus” along the way, he proclaimed himself to be the “restorer of the world and the army”, which was reflected on his extensive RESTITVT ORBIS coinage. He then campaigned in Asia Minor against the pirate Lydius the Isaurian and his raiders. Meanwhile, Saturninus rebelled and claimed himself emperor (either in Antioch or Egypt), but was killed shortly thereafter by soldiers loyal to Probus. Having defeated Lydius, he spent Winter 280 in Antioch and signed a peace treaty with the Sassanian King, Varhran II, gaining him the title of “Persicus Maximus”. As Probus was in the far eastern part of the empire, trouble started all over again in the west, this time internally in the form of usurpers. As such, he needed to go all of the way back to Gaul to get things under control again and deal with Bonosus and Proculus in Cologne, who both claimed to be emperor. It took several months or fighting, but Probus did emerge victorious and headed for Rome, arriving there in late 281. Finally having a chance to celebrate his hard-won victories, Probus sponsored massive games with thousands of animals, captives and gladiators meeting their ends for the entertainment of the crowds. After the celebrations, Probus decided to set out to finish what Aurelian wanted to do with conquering Persia. He got as far as Illyricum when he discovered the troops under Marcus Aurelius Carus, his praetorian prefect in Raetia and Noricum, elevated him as emperor. Deciding it was something his subordinates could handle, he sent troops to deal with the situation. Unfortunately, they decided instead to defect when they arrived. Word got back to camp and the remaining soldiers decided they too had seen enough work under Probus, especially the civic projects, and murdered him in a look-out tower near Sirmium, in September 282.